Protesters across Bosnia set fire to government buildings and fought with riot police on Friday as long-simmering anger over lack of jobs and political inertia fuelled a third day of the worst civil unrest in Bosnia since a 1992-95 war. 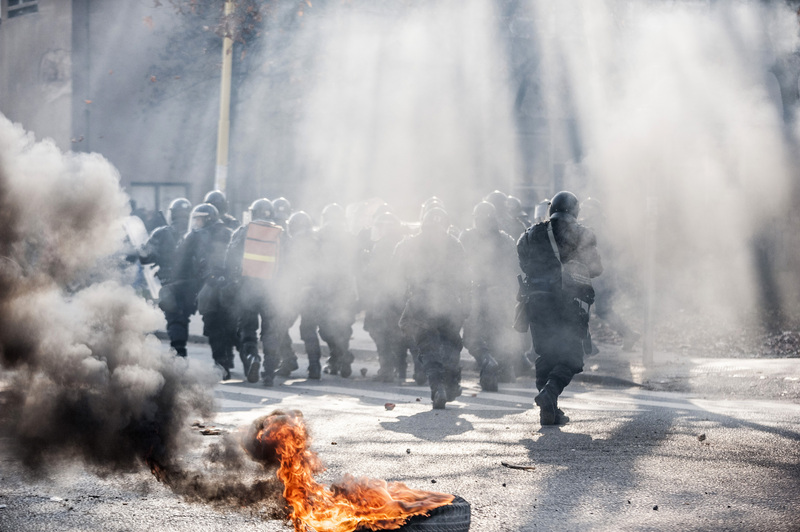 Tear gas and smoke blanketed downtown Sarajevo, where police fired rubber bullets on several thousand protesters who set fire to the headquarters of the cantonal government. They also tried to force their way into the seat of the country's presidency, but were repelled by special police firing water cannon. Well over 100 people are estimated to have been injured so far in the protests. In the town of Tuzla, once the industrial heart of northern Bosnia, protests over factory closures again turned violent. Demonstrators stoned and torched the seat of the local authority and clashed with police. Trapped by the flames, some leapt from windows, a Reuters photographer said. "I think this is a genuine Bosnian spring. We have nothing to lose, there will be more and more of us in the streets, there are around 550,000 unemployed people in Bosnia," said Almir Arnaut, an unemployed economist and activist from Tuzla. A Reuters reporter said two cars and a police guard's cabin were set on fire in front of the presidency building in Sarajevo and black smoke could be seen from afar. "I feel like it is 1992 again," said Amira Sadikovic, a professor, as protesters pelted the local government building with stones, cans and bottles as it was licked by flames. A spokesperson for Enlargement Commissioner Štefan Füle called for protesters and police to avoid resorting to violence in the EU candidate country. "Citizens have the right to express their dissatisfaction through non-violent gatherings. We regret the high number of injured persons, and urge all involved to avoid violent acts and engage in dialogue to resolve problems," the spokesperson said. Bosnia's recovery has been held hostage to an unwieldy power-sharing system based on ethnic quotas set in the US-brokered peace deal that ended the war, in which an estimated 100,000 people died. The government held an emergency session and called on protesters to negotiate. "As long as there are ethnic divisions, deeply rooted corruption and nepotism there will be no solution for this society," political analyst Gojko Beric told Reuters. At least eight people were injured in Tuzla, police said, including two police officers, one of them seriously. The European Commission presented on 10 October 2012 the progress reports on the countries on their way toward EU accession, including Bosnia and Herzegovina. The big laggard in the group was Bosnia and Herzegovina, where the Commission noted that governance reforms are stalled and that the main ethnic entities - Serbs, Croats and Bosniaks - lack interest in pursuing a common future.